A cocktail of violence pitting supporters of the two main political parties - the AC and the Peoples Democratic Party (PDP) – triggered a complete breakdown of law and order, forcing the electoral commissioner to postpone the re-run vote indefinitely, amid reports of ballot snatching and gun battles by hoodlums and political thugs personnel who have put the state virtually under siege. The two main political parties - the AC and the Peoples Democratic Party (PDP) blamed each other for the violence that also involved Journalists who were harassed during the mayhem allegedly spearheaded by some party chieftains in a desperate bid to rig the voting. Battle-ready security agents were deployed to the community yesterday, to prevent further clashes in the tension-gripped community after a chieftain of the Action Congress (AC), Senator Lawrence Agunbiade, was macheted and had to be admitted at the hospital. At least 25 people were arrested including polling observers, said to have been remanded in protective custody. The observers, including Dr. Abubakar Momoh, a professor of political science at the Lagos State University; Ms. Bimbo Adewumi, Dr. Azeez Olaniyi, Wahab Oyedokun, all of the Civil Society Monitoring Group, and Babatunde Awodehinde, Olusoga Olusegun and Foudad Oki of the Campaign for Defence of Human Rights (CDHR) suffered severe injuries after they were mobbed by thugs before the police came to their rescue. Despite the violence, the election was relatively peaceful with impressive turnout of voters at some polling centers in the 61 of the 63 wards (representing 9 out of the 10 local government areas) where the elections actually took place. Voting in two other wards in Oye - Ekiti in Oye Local Government area was postponed. First to Sunday April 26, and then postponed indefinitely. There were reports of ballot snatching in some areas and the ballot boxes were allegedly taken to private homes, where they were stuffed with ballot papers. The presence of mobile policemen notwithstanding, in Ijero and Ipoti-Ekiti, ballot boxes were snatched at gunpoint by thugs who stormed polling stations to scare away. Meanwhile, the whereabouts of the resident Electoral Commissioner for Ekiti – Mrs. Ayoka Adebayo, - the returning officer for the re-run election, remains a mystery. However, with the postponement of the elections in Oye LGA, election results in 5 Local Government Areas - Ijero, Ise-Orun, Irepodun-Ifelodun, Gbonyin and Ekiti South-West have been officially announced. The results so far show the PDP and AC running neck-in-neck. Keen observers have been asking why INEC has not announced the results of the other four Local Government Areas in the 9 Local Government Areas where elections were held and completed on Saturday. It is important to note that the registered voters in the two outstanding wards in Oye LGA is 18,000 and curiously more than the about 7,000 registered voters in 10 wards in Ise-Orun LGA where elections were held yesterday with AC leading and where a Chieftain of AC thereof - 73-year old Lawrence Agunbiade (a.k.a Laco) attacked by gunmen. 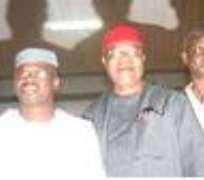 Recall that Oye-Ekiti is home to PDP Senator Ayo Arise who was reportedly arrested by police and flown to Abuja yesterday 25th April 2009, in respect of violence connected with the stalemate re-run elections. The Independent Electoral Commission, INEC blamed the lack of security in the two wards in Oye-Ekiti for the decision that did little to calm the festering tension. The atmosphere in Ekiti State , particularly, the Capital City - Ado-Ekiti was tense as at Sunday evening, with pockets of demonstrations and burn fires around the city by youths dis-satisfied with the development. But for a heavy down-pour the situation might have gone out of hand. Incidentally the AC Governorship candidate - Dr. Kayode Fayemi is from Isan-Ekiti in Oye local Government while the PDP candidate – Engr. Segun Oni (the ousted governor) is from Ifaki-Ekiti in the neighboring Ido-Osi Local Government Area. At the end of the re-run election, about 25 persons were arrested for electoral offences. The state interim Commissioner of Police, Mr. Yakubu Alkali, confirmed the arrests for different offences ranging from ballot snatching to attempts to rig the election in favour of their candidates. Although there was no election in the capital, Ado-Ekiti, looked like a ghost town yesterday, with deserted streets as business and social activities were shut down. Policemen maintained security by searching all vehicles, amid reports that some residents evacuated on the eve of election.